So she says its a “bit of a disaster for you and a few others” with which Kimi responds with “I don’t care about what happened to the others”. Sure it sounds rude and it is not exactly “politically correct” to be so blunt. However, no driver cares about the others in such a situation. They care about setting a fast lap. And sometimes mistakes happen. It can sometimes give a yellow flag, sometimes not. Or when someone crashes in a race and brings out the safety car. Plenty of people have lost races due to this but I cannot recall anyone ever saying sorry for causing a safety car. It happens while drivers push themselves. Anyways, his first Q3 run was quick enough for 8th which is bumped up to 7th due to Buttons gearbox penalty. Could have been worse. 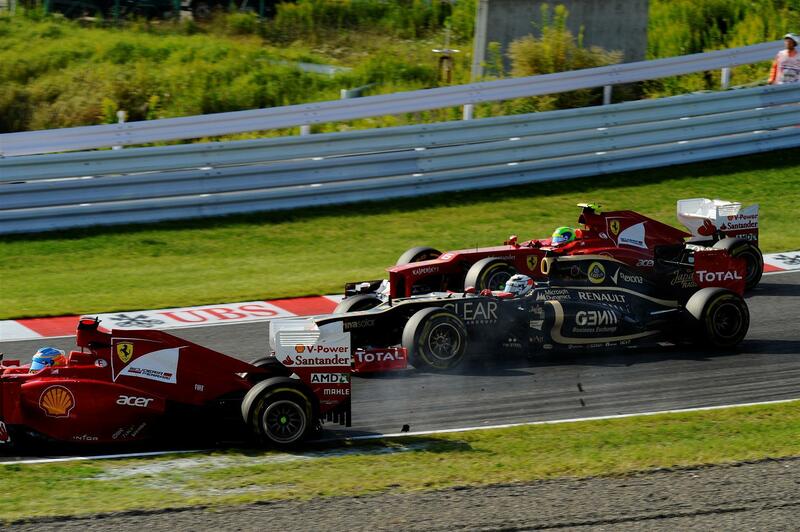 He is just a tad late in blocking him and keeps squeezing Kimi until the Lotus is on the grass. Kimi could do nothing but was skilled enough not to spin out of the race himself. Instead Alonsos wheel makes contact with Kimis front wing (which breaks off a rather large piece) and the puncture is instant. Off goes the Scandalman in a cloud of dust. Yea, bad luck Alonso. Right.. You were the architect of your own demise as Keith Collantine so eloquently put it on his Twitter account. Are your toys starting to come out of the pram one by one? To which I say: Tsk tsk Alonso. You must not tell lies. And ALL DA TIME YOU HAVE TO LEAVE DA SPACE! Also a breakdown of Grosjeans blunder while slamming into Webber, which earned him a stop and go. Havent seen one of those in a while. But this is getting serious for Romain. His confidence must be really shaken. Not to mention the large amount of millions he is costing the team in lost points. I have a feeling not all is said and done on this. All right. On with the show as the late great Freddie would have said. But first the safety car has to come out and in again after cleaning up Fernandos, Romains and also Brunos mess that retired Rosberg from the race. Phew. And that was just turn 1. The Lotus cars are not good at restarts as we have seen. Tire heating issues is the culprit. 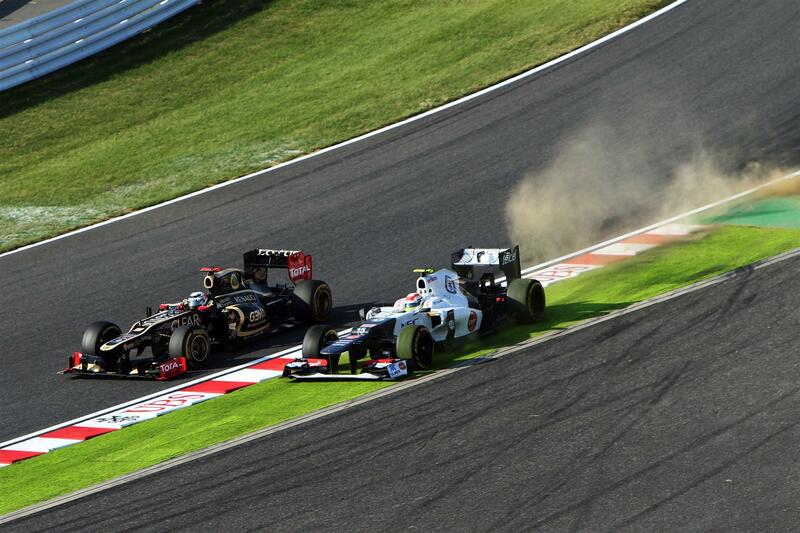 And sure enough, Perez hooks onto the backend of the #9 Lotus and tries a pass on the outside in turn 1. But Kimi is not playing around today and holds his ground and racing line perfectly, forcing Perez onto the runoff. 5th position kept. Button made a great start from 8th to 3rd before the Safety Car, helped by retirements and slipping through the mayhem unscathed. Massa has done even better and is running 4th from 10th when the dust had settled. Up ahead is Kobayashi and Vettel in front. Meanwhile Perez has pitted. He had plenty of free air to get in some good laptimes. But surprisingly he emerges behind behind the Lotus of Kimi. Well done. Hamilton is also able to jump ahead of Perez in the pitstops. So he slots in behind Kimi. Seems the Mexican had a bad lap somewhere. The biggest winner in the pitstops is Massa. He went from 4th to 2nd after his first stop. Helped by Kamui and Jenson being held up by the other Toro Rosso of Ricciardo. Felipe baby wants podium. gugu-gaga. 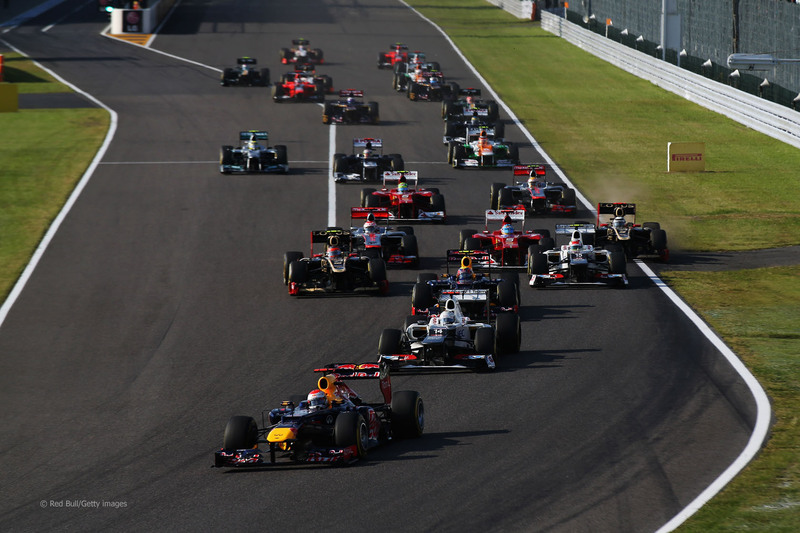 Hamilton is in DRS range of Kimi but overtaking is hard at Suzuka. For some strange reason FIA shortened the DRS zone from last year. No idea what the motive for that was. But the McLaren starts to fall back from the Lotus after a few laps, apparently struggling with understeer. At the end of his stint the McLaren seems to rectify its problem and starts gaining on Raikkonen again. The gap is below 2 seconds when the Lotus pits for the second time on lap 30. He comes out in clean air while Lewis pits one lap later. Hamilton comes out from the pits neck and neck with Kimi on the outside. Kimi has the momentum but Lewis the inside line and Kimi shows of his lightning sharp reflexes to avoid a coming together. So Lewis takes 5th place. The reason for that is pretty much down to a crappy Lotus pitstop and a brilliant McLaren one. 21.2 vs 19.8 seconds. That is a huge chunk of time in F1. 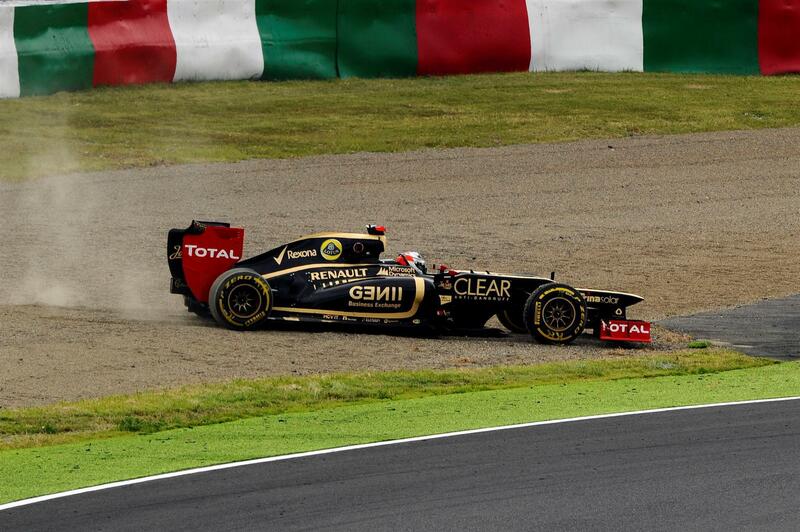 Not the first time Lotus has lost Kimi a position in a race. From then on the positions are basically held. Vettel is up ahead looking like its 2011 with a 20 second lead to Massa in 2nd. Kobayashi is holding on for dear life to his podium position at his home race while being hounded by Button. Kimi in 6th also has to think about Hulkenberg who is closing in. Looking at this race, one would hardly believe that Kimi holds 3rd place in the WDC. Because the car was great before the summer break. Fast enough to potentially win in Hungary. After the summer break, it has been damage control, brilliant driving from the Iceman and some luck from other peoples retirements that have kept him in the title hunt. The elusive DDRS device have not yet made its race appearance and one wonders if it ever will. Oh well, its still a fabulous day as Vettel crosses the line and gobbles up Fernandos lead down to 4 points. Attaboy! Massa takes his first podium since the shameful race in Germany 2010. 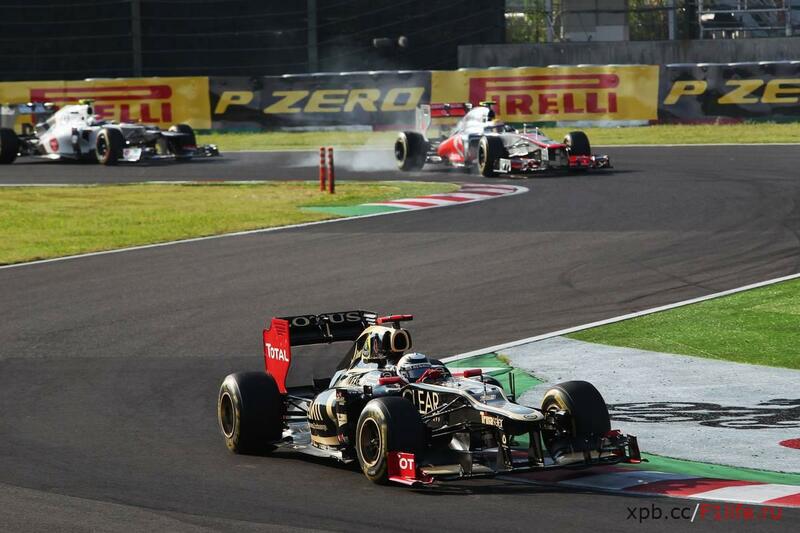 (Edit: Korea 2010, actually) And Kamui holds on for 3rd place! Not since 1990 has there been a Japanese driver on the podium in the Japanese GP. The crowd erupts in cheers and praise for their home driver. Domo arigato Kamui-san. Well done. Massa: Look at me. I’m the painting “The Scream” by Edvard Munch. The race is a 6 out of 10 in itself. However, it is rewarded 9 out of 10 for that delicious first corner incident that pretty much reset the counters of the championship 😀 I like it. I like it a lot. Korea is coming up this weekend. And only a retirement can stop Vettel there it seems. Lotus is still talking of some big updates that will be utilized for this race. So lets wait and see. I admit that my hopes for Kimi taking the title are dwindling but stranger things have happened. 5 races to go. Come on Kimi. Kick it Gangnam Style in Korea. This entry was posted in Formula 1 and tagged 2012, Alonso, Alonso crash japan 2012, alonso crash suzuka, alonso raikkonen crash, Button, Felipe Massa, Ferrari, Formula 1, Hamilton, Ice cream incident, Iceman, Kamui Kobayashi, Kimi, kimi raikkonen, Kobayashi, Kobayashi podium suzuka, Kobayashi third place, Lotus E20, lotus team, Massa podium japan, McLaren, michael schumacher, Podium, Raikkonen Alonso crash, Santander, Sauber, Sebastian Vettel, Suzuka, Suzuka Gp 2012, Vettel. Bookmark the permalink. Kimi was no way going to lifted except he is expecting the iceman to make a contact with the driver at his side. And truthfully, Fernando was having a real slow first lap to be honest. Let’s make it a racing incident because I am sure Fernando is having a slow lap (he has no room…) while Kimi is definitely out of space. So to be fair no one make any mistake. The fault shouldn’t be lies on Kimi’s shoulders, really. It was so sweet, so happy and I was in tears watching the crowd chanted ‘Kamui’ 😀 It is a well deserve podium for himself (even though it might not have secure his seat with the team) and for Japan. 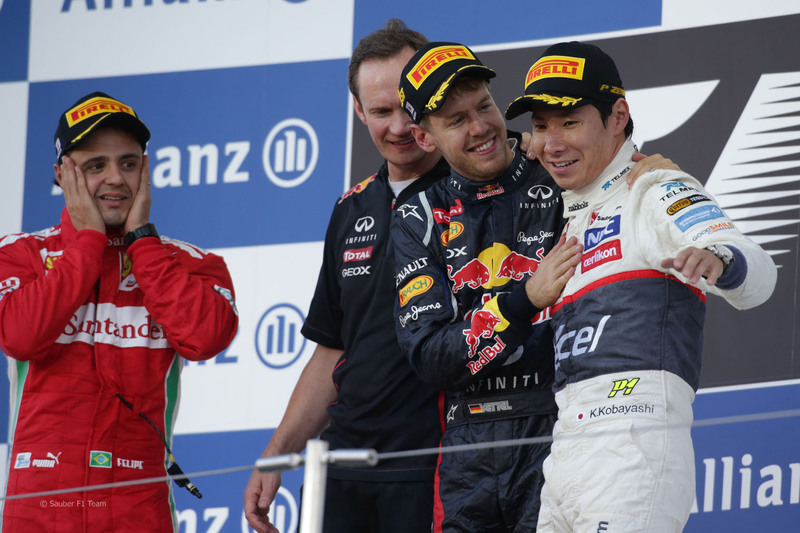 I find it sweet to see Sebastian congratulated Kamui and mention about their last time together on podium was in Formula 3 😀 There may have been a driver did that but not much really doing it. And then Kamui told the crowd about the same thing in Japanese awwwwww ^_^ That was so so so sweet..
Haha thanks for the review, Soren. As always you did an amazing job. There is no edit button, sorry for adding another reply. I mean to said I am pissed of with the yet again no DDR debut. Oh no, I think they might have abandon to test the DDR. It does looks like that way though…. I really think that more or less that DDR should help a bit because Lotus has no pace AT ALL! And that’s upset isn’t it ? Also, Romain haha Webber was so pissed of! I think he was right, Romain needs another vacation. I just hope he didn’t ended up trying the same stunt on Kimi, well one day. Thanks Saima! Yea. Good replay that one. thoroughly enjoyable review soren! really appreciate the youtubes of ant davidson’s commentary. especially the kimi/hami moment out of the pits. even in slo mo you can hardly see the iceman’s hands move!! lightening fast! But Kimi hasnt lost one ounce of his skill. Outstanding. Really enjoyed this review. Well done. Kimi was born to drive and really truly is second to none. Can’t say the same thing for the car. Let’s hope Lotus can bring it in Korea.